The Greater Tompkins County Municipal Health Insurance Consortium began operations in 2011 with 13 Tompkins County local governments as its founding members. 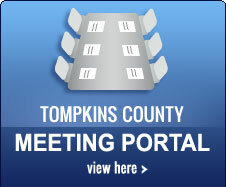 Tompkins County Administrator Jason Molino has delivered to the County Legislature a 2019 Recommended County Budget and 2019-2023 Capital Program. The Legislature, by unanimous votes, approved resolutions marking two milestones for Tompkins Cortland Community College (TC3).